Any accident, no matter how small should be a cause for concern as it demonstrates that either safety training needs reviewing or there are risks that are not being adequately managed. In the event an accident does occur, here are our five steps to help you deal with them efficiently, confidently and comprehensively. 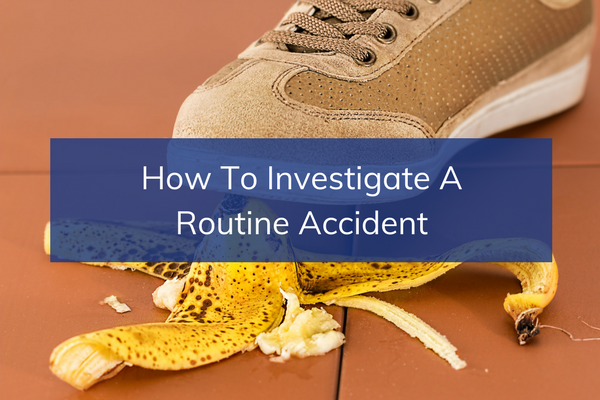 There is no such thing as a routine accident. All accidents regardless of severity should be subject to a comprehensive investigation so that lessons can be learnt and future reoccurrences prevented. In addition, what seems like a minor incident can lead to long term injuries and a serious cost to the business for any personal injury claim. Imagine that a worker had slipped on some soap suds in the valet bay, when valeting a car 2 years, 364 days ago. There were no major injuries at the time, it simply went in the accident book and got filed away. Now a solicitor’s letter has landed on your desk claiming for a long term chronic back injury – with a loss adjusters reserve of £45,000. It’s vital to investigate the accident, as soon as it occurs and put in place the measures required to protect your workforce. If not, you could be required to start your investigation 2 years, 364 days after the event! Negative witness statements are as strong and effective as positive ones. If someone didn’t hear or see anything, that information is just as important, so ensure that statement is recorded. This could be extremely beneficial in a spurious claim. Nothing is more powerful than visual evidence, so whilst someone else is taking the witness statements, get photographing. Using the camera on your mobile phone is perfect as the photos are date/time stamped, giving you valuable evidence for any future claim. Make sure you get photographs of the entire area where the accident happened, as well as the injury and any other evidence you think is important. Back up these images as they will be massively important and you will need to keep them for at least three years. You don’t want to risk losing them if you damage your phone or discard it when you receive your annual upgrade. CCTV is a loss adjuster’s dream. If you have been fortunate enough to have captured the incident on your system, make sure you get a copy as soon as possible, it will save you from trawling through hours of footage years down the line and avoid the risk of the incident being recorded over. Over the next few days, you should gather together all the information you have and file it. The reason we adopt the above procedure for any incident, no matter how small, is to prevent a further accident by identifying the appropriate measure that we need to put in place. This could be blatantly obvious and easy to fix, blatantly obvious and costly to fix or more of a long-term culture issue and behavioural change. Either way controls need to be actioned. If a capital expenditure is needed you need to make it very clear to the authorising department that this is for health and safety purposes. Be prepared to outline your risk assessment to show the rationale behind your request. Whether your business is a car dealership, a retail business or office based, it’s vital to accurately and thoroughly record accidents to help you identify trends and address risks. The same or similar accidents could be happening elsewhere in the business, in other offices or locations. Comprehensively managing any accident, no matter how small, will help you protect your workforce and position your business as a well-managed risk to both insurers and the HSE. For help managing your businesses’ accident reporting processes get in touch by calling 0161 486 5020, 0203 1264 997 or emailing us at [email protected].